We’re all for confident players coming into the NFL. But one 2019 draft prospect might be testing the boundaries a bit when it comes to one of the league’s most accomplished head coaches. 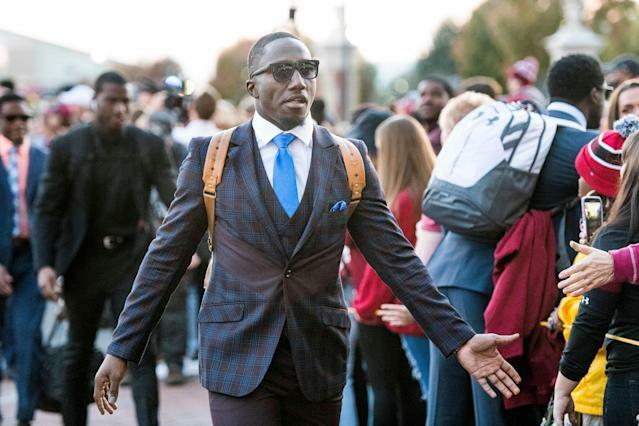 The New England Patriots hosted South Carolina WR Deebo Samuel recently for a visit, and Samuel documented a snippet of that visit on his Instagram account. Nothing wrong there. But it’s how he chose to address Patriots head coach Bill Belichick on his way out of town that is most interesting. Did even notorious instigator Bill Parcells even call Belichick “Billy” back in their days together? What about Belichick’s parents after the age of, say, 9? Now he’s hearing it from a 23-year-old who has yet to play a snap in the NFL, basically predicting the Patriots will draft him. Most prospects meeting the GOAT of current coaches for the first time might refer to him as Mr. Belichick, Coach, or something else ... perhaps, Lord of the Rings? But not Deebo. Interesting strategy. We’ll see how that plays out. How will Bill Belichick take this? Look, Belichick is not a humorless man. That’s been well-documented by former and current players and coaches, even if his public facade is quite stony. They all say, almost to a man, that Belichick is actually quite funny behind closed doors. He does let it creep out into the public sphere on occasion. There’s a decent chance Belichick sees this — and you know he’ll see it — and just shrugs or smiles. After all, it’s not changing Samuel’s draft grade on the Patriots’ board, we suspect. And Samuel is a good player. A very good one, in fact. We have him ranked as our No. 48 overall prospect in the 2019 draft class, and he very well could be drafted higher than that. Going in Round 1 might be a bit early, but we absolutely could see him going off the board in Round 2 — and the Patriots own two picks in that round. Don’t think for a second the Patriots aren’t high on a player who has scored 28 touchdowns on only 217 college touches — 16 TDs as a receiver, seven as a runner, four on kickoff returns, one on a fumble return after a muffed punt and two as a passer. He’s an extremely Patriots-ish prospect in many ways. And they certainly need receivers, too. It’s pretty much Julian Edelman, Phillip Dorsett and a bunch of no-names right now. It would not be stunning to see New England draft more than one wideout. Samuel also got his nickname — his birth name is Tyshun — from his father via the tough-guy character in the movie “Friday.” Growing up in a tough area and getting bullied a lot, Samuel refused to back down, earning the nickname and giving opponents a taste of the kind of player he’s become. It’s clear the young man operates with a chip on his shoulder, which is a good thing. But if Samuel ends up in New England, we suspect this “Billy” thing might be put to an end fast. Sure, maybe Belichick won’t be the one issuing the gag order on it, but Samuel likely will learn the unofficial edicts of the Patriots Way fast if he does end up in New England.